PUR HAS TOTALLY CLEANED UP MY ACT! A while back we all remember my coffee dilemma, but now I drink really clean coffee! Mmmmm Can’t you just smell the aroma! Well, I not only have the pitcher now that PUR has, but I also have their pur Water Filtration System. The mineralclear. Filters water over natural minerals for a crisp, refreshing taste. *Certified to reduce lead, chlorine (taste and odor), microbial cysts and much more! Now first let me tell you I’m not all that handy putting things together, and figuring things out. Oh, I eventually can do it don’t get me wrong, but this little wonderful gadget is 1-click installation! (Isn’t that cool?) Even I can do it. Well, my first was was a horizontal filtration system, and my kitchen is what they call a walk in kitchen, so it’s rather small, and the only dishwasher I have is at the end of my arms. ~hehe~ My sink is rather small too! So there wasn’t really much room to rinse dishes when I was washing them. As you can see if I had a pot the horizontal faucet mount makes it a little difficult to rinse it for me. So, I contacted PUR, and asked them if they had something different. Well, do you love these people or what. “Also, did you know that with your purchase of this PUR Water Filtration System you will be donating a week’s worth of clean drinking water to children in the developing world through the Children’s Safe Drinking Water program”. Visit www.csdw.org to find out more. *Disclaimer: Product was provided by PUR or their participating PR in exchange for my honest review. Opinion is 100% my own and no monetary compensation was given. 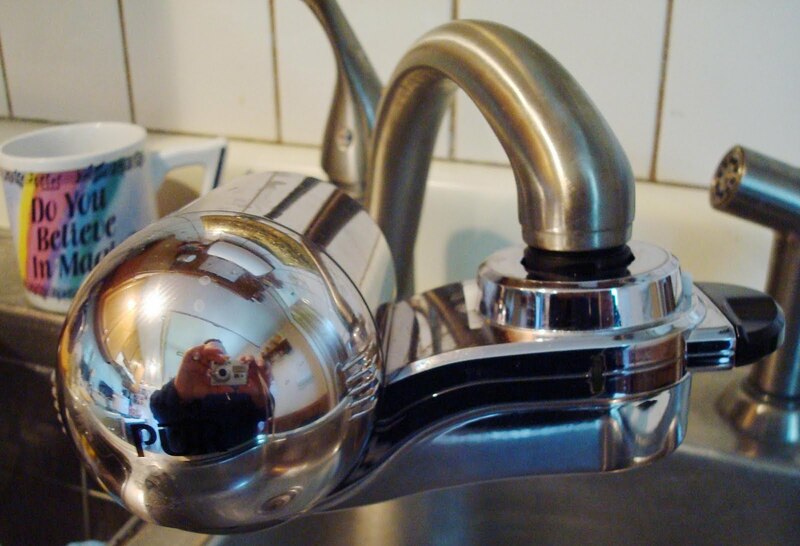 I love my new faucet mount, and it’s so easy to install. Just one easy click! THANKS PUR! Hi! I’m your newest follower from the Saturday blog hop! Hi there, I am not sure if you got my email or not (colie@colieskitchen.com) but I sent you one last night letting you know that you were the winner in our gourmetgiftbasket.com gift basket giveaway!!) Please send me your mailing information!! Happy Saturday, hope you’re having fun! Thanks for following and the heads-up on the Monday meme!! I’ll be there!! I don’t care where you’re located, tap water is ALWAYS going to be nasty! So I’m in agreement with you that clean drinking water is a MUST! I know your house looks so Halloweeny since you’ve been decorating. Are you going to be posting up some pictures? I want as many people as possible to know about the Monday Music blog hop so I’ve been trying to bring as many to my blog as I can so they’ll see it at the bottom. No one will see it on my Twitter page – I don’t even go there so I’m trying to do my part from Friday to Monday morning from my blog. It’ll take time, but it’ll grow – you’ll see. Yep! My song is picked and (as Jamie Foxx use to say..) I’m ‘ret to go! Smiles. Count me in on the Monday Music Blog Hop. I’d love to know if you post that Sun. night or Monday, but I’ll check back. You are all decked out! Love it! ALOHA FRIDAY PHOTO FLASHBACK.FRIDAY FOLLOW 40 & OVER! HURRY UP AND WAIT!